Another meal from my newest appliance Instant Pot. I have quit making pork chops as we feel they are too dry and tough. I decided to try them in the pressure cooker and looked for recipes to use. Most of them called for a can of mushroom soup and water which I am not supposed to eat so took the directions and used a mix of chicken stock and beef stock for the liquid. One of the things I like the best is the sauté function. These chops turned out great and as I had put potatoes on the rack and placed the rack over the chops we had a meal ready to go. You could add vegies also, just be sure they take about the same amount of time or close to the end of the time, let the pressure down and add and than bring back up to pressure to finish. I just used the juice but it is easy to thicken for gravy. Season chops and put oil in the instant pot. Turn to Sauté function and brown chops on both sides, if you need to, brown in two batches. Remove to a plate and add the stock and sherry if using to deglaze pan and loosen brown bits from the bottom. Add the pork chops back and the juices from the plate. Place rack over the chops and place peeled, quartered or halved potatoes on rack. Lock lid in place and using manual setting, set time for 18 minutes. When timer runs down, use a natural release or wait 10 minutes and turn to vent and let the rest of the pressure down. Remove potatoes and chops, keep warm and thicken broth for gravy if desired . This looks delicious. What cookbook is the receipt from? I am having trouble trying to decided which book to buy. Also, what gives the gravy the red color? Thanks. 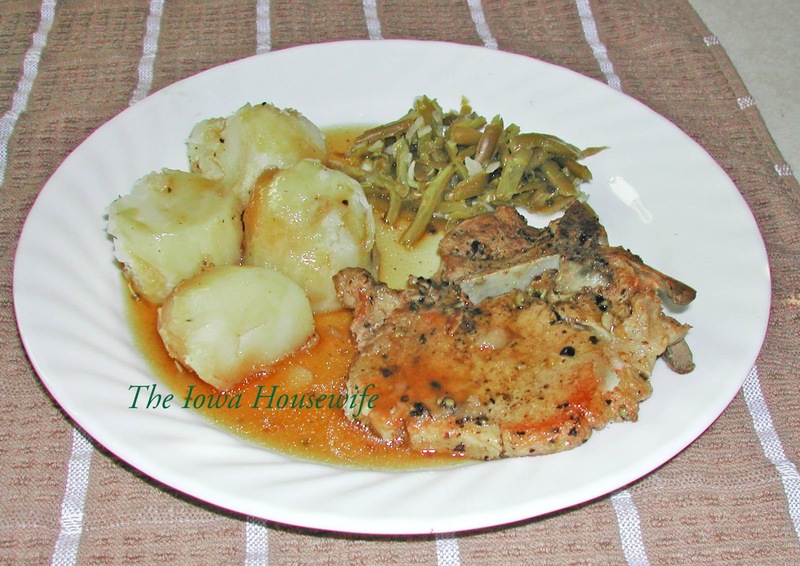 I just used the directions for pork chops in the manuel and the red color should be brownish red, and just from browning the chops and adding some sherry to them. I added the potatoes as I wanted some and used the cooking time for potatoes which is about the same. If you look at some earlier posts we have a post on which books we like. Hope this helps. Hi Myrna, brand newbie with instant pot...first meal last night...baracoa beef that was terrific. Quick ?? re potatoes - - I have new potatoes that are probably egg size that I'd like to use in this recipe. will they work? Thanks from the northeast USA. I would they think they would. If you look you will see that I cut my potatoes in chunks. 18 minutes is not a lot of time just put them on a rack. You can always let the pressure down and put in later but I don't think you have to for that length of time. A roast would take more time so for that I wouldn't put that small of potatoes in till after it has cooked for awhile. Hope this helps.